Butterflies are beautiful little creatures that go through a total of four life stages since their birth. The Egg: This is the first stage of a butterfly’s life cycle. A butterfly egg can be of varying shapes and sizes, because it purely depends on the type or species of butterfly that has laid the egg. Usually, a butterfly egg may be spherical, oval or cylindrical in shape. While some eggs may have a fairly smooth and shiny surface, some might also have a ribbed texture, again depending upon the parent butterfly. An amazing thing about the egg shape of butterflies is that one can see the tiny caterpillar growing inside of it. Moreover, the butterfly which lays the egg has to ensure that she lays it on a specific type of leaf or a twig that the caterpillar can eat, once it hatches out of the egg. The Larva (Caterpillar): The second stage of the life cycle of a butterfly is known as the larva stage. Here, the butterfly is just a tiny caterpillar that’s hatched out of its egg not very long ago. The main function of a caterpillar is to eat, and that is all they do in this stage of life. This is necessary because the caterpillar has to take the required shape and size and grow fully in order to be prepared for the next stage of the life cycle. While the caterpillar eats, it also grows instantly, but its skin doesn’t stretch or show any growth. Which is why, they shed their skin several times while they’re growing. Though the exoskeleton of a caterpillar doesn’t indicate any growth, but from the inside, a caterpillar continually grows to be an adult. The Pupa (Chrysalis): In the third stage of its life cycle the caterpillar comes to be known as pupa, or chrysalis. At the start of this stage, the caterpillar has already acquired its full height and weight, but it hasn’t developed its limbs and wings. So for that to happen, the caterpillar forms itself into a cocoon, or a pupa. The pupa’s color keeps getting darker as the caterpillar inside grows into an adult. Apart from this color change, no other transformation in the caterpillar can be spotted from the outside. However, inside the pupa, the caterpillar rapidly changes its form and develops limbs, tissues, and organs, one after the other. Once the caterpillar is done growing its body parts inside the pupa, it becomes ready for the next and the final stage of its life cycle. The Adult (Butterfly): The fourth and the final stage of a butterfly’s life cycle is when it comes out of the pupa as an adult butterfly. When the butterfly first emerges out of the chrysalis, its wings are folded against its body. It soon starts pumping blood to the different limbs and organs to get them moving. In about 3 – 4 hours of time, the butterfly learns to flap its wings and masters the functions of flying. After they’ve grown fully and matured enough, butterflies look for a mate to copulate. 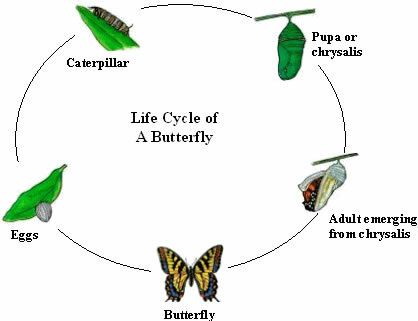 The life cycle of a butterfly starts once again after reproduction, when the female butterfly lays its eggs on the leaves or twigs of a plant, tree, etc.